treated named Kyoto for the city in which the key conference was held. these (so the other 106 were really going out on a limb signing it). China, India, Brazil and most of the third world are exempt from its limits. We will discuss the costs and benefits of CO2 reduction a bit later. why the United States refused to sign, even when Al Gore was vice-president. predicted to have higher CO2 production than the United States by 2009.
major world economies did not enjoy. never made and which Europeans were never going to make. already on target to meet the goals and the US would be far behind. Since 2000, however, it has been a different story. same time the US experienced a post-9/11 slowdown. which have much higher fuel taxes and heavier nuclear investments. abatement dollars on things that really matter. 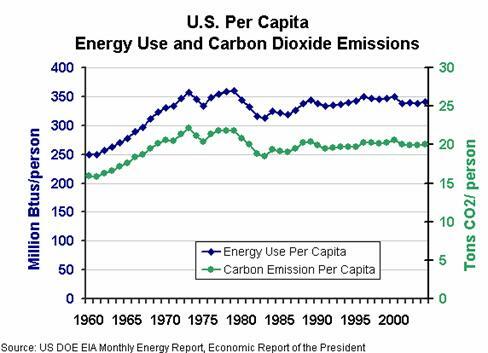 gasoline produces more, and coal produces the most). peaceful internal growth than it can from trying to loot its neighbors. warmer world. Its not at all clear which is better. hundred years, and even that based on arguably over-inflated IPCC models. variability rather than a drastic increase in summer high temperatures. outnumber heat-related deaths, will decline. Remember the power of compounded growth rates we discussed earlier. A world real economic growth rate of 4% yields income fifty times higher in a hundred years. A world real economic growth rate two points lower yields income only 7 times higher in 100 years. So a two point reduction in growth rates reduces incomes in 100 years by a factor of seven! This is enormous. It means, literally, that on average everyone in a cooler world would make 1/7 what they would make in a warmer world. feel better about man being in harmony with the Earth but a billion Asians get locked into poverty. world, what we can be certain of is that these storms will be more devastating and kill more people in a poorer world than a richer one. make the world a much safer and more stable place, particularly vs. a cooler world with a billion Asian poor people who know that their march to progress was halted by western meddling. Indonesia, into the top end of the parabola. Is Brazil, for example, more likely to burn up its rain forest if it is poor or rich? world be canceled out by the costs of a warmer world? 2085-2100, but not necessarily for others. implicit in all calls to take actions now that would go beyond "no-regret"
unlikely to happen, at least until after the 2085-2100 period. alternative energy Manhattan project. This can only be a disaster. spontaneous order we call the marketplace, things, well, would be better. actually increases rather than reduces fossil fuel consumption. before we were really ready to do something about it or follow up the efforts.